Hi everyone! 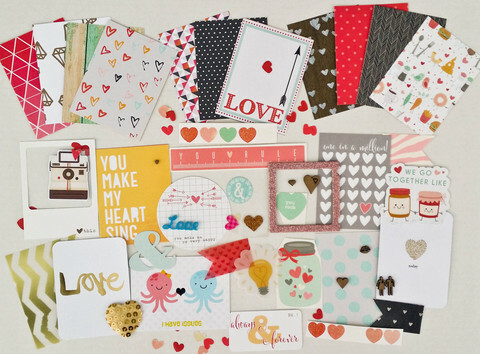 Today I'm sharing a Valentine's Day card made with the February Swag Bag from Paper Issues. Although I have "traditional" red, black, pink and white on here, I love the unexpected bit of orange in the Gossamer Blue Get Happy paper. I think it adds a fresh, contemporary look to the card. Here's a look at the February Swag Bag in case you're interested in getting one for yourself. Use the code LISA20 to get 20% off your order. 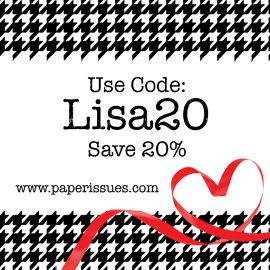 How are you doing with your Valentine's Day cards? Do you make them or do you go with store bought? Love it! The black really makes the pink pop. 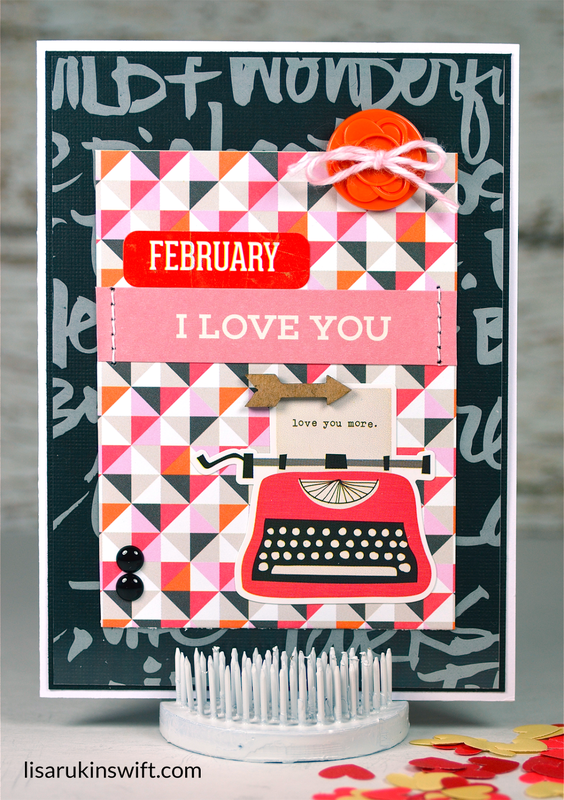 Definitely a fun color combo, Lisa, and fab card! Loving this graphic card, great mix of bold patterns! What a striking card, Lisa! Such a great card, I like that the colours pop off of the black background. Adorable, love the added touch of the button! So gorgeous! LOVING that typewriter!!!!!! Love the color just shining away on the black background! Very sweet! Love the mix of these patterns Lisa!! Really awesome card!! Adorable card! LOVE that typewriter!!! FUN card and perfect for my husband - whenever I tell him I love him He ALWAYS says I love you more!! hehe - He is my favorite!!! But seriously - you have done a fabulous job on this card!! Love the black enamel dots, that sweet wooden arrow and the gorgeous orange flower button!! Wow - such great elements you have brought together to create a Stunning card!!! Have a super good day!! !